Look, I admit it. After a hard day of blogging, I like to take out the pool chair, turn on the transistor to catch Joe and Dave describing the Red Sox game, and pop the tab on a refreshing Miller Lite. Sure, my choice of beverage might offend some of my colleagues, with their fancy degrees and their pinky-raised Chablis-sipping ways. But I’m all right with that. And do you know why? Because Miller Lite tastes great. 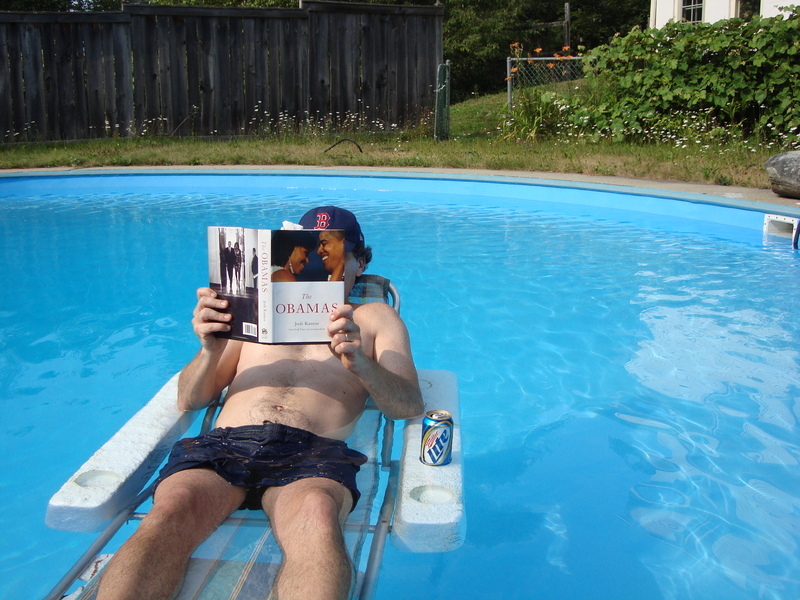 And nothing makes an intellectually-weighty tome like The Obamas go down easier on a hot summer day. Miller Lite. The drink of non-partisan presidency scholars living in Vermont (when the weather is hot). Your sunbathing has increased the Earth’s albedo by 0.1%. I like that you’re doing your part to fight global warming. It’s lite in every sense of the word. Do they sponsor blogs? If so, I’ll consider switching…. Those aren’t weeds – those are grape vines! (In case I want to make my own chablis…er….chardonney)! First, I was surprised to see you reading that book, but thanks for the review, makes me more interested in putting it on my reading list. I wasn’t sure inititally. Secondly, the (Vemont) heat that had you heading to the pool…and Miller Lite, has (with DC record breaking highs) driven me to my pool as well, but alas, I lack both the chair and significant loyalty to any particular beer…. If you are short on funds, spring for the chair first. It makes all the difference. I had to look up the word “albedo” in Brett’s comment above and found 1)the ratio of the light reflected by a planet to that received by it and 2)the white, inner rind of a citrus fruit. Given the photo, both would seem to fit. People don’t seem to realize that, for a Vermonter who spends a good chunk of his days indoors blogging – that’s a tan!